Koonara Wines is a popular wine producer in Coonawarra and South Australia. This winery uses their own farm-grown grapes to create authentic hand-crafted wines. Koonara Wines always emphasise their traditional hand pruning and wine making methods, with an aim to create quality wines. Their vineyard property is always low yielding with only 1.5 tonnes of grapes per acre, so the winemakers at Koonara Wines are able to create intensely flavoured wines. From their farm-grown berries, Koonara Wines make some of the highest quality wines in Coonawarra. Even though this is a newly established winery, they have been able to gain the reputation as a premier wine maker in town. This family-owned winery always aims to satisfy its clients. Since 1991, this winery created special cases for family and friends and later, in 1999, they decided to start their own winery business. 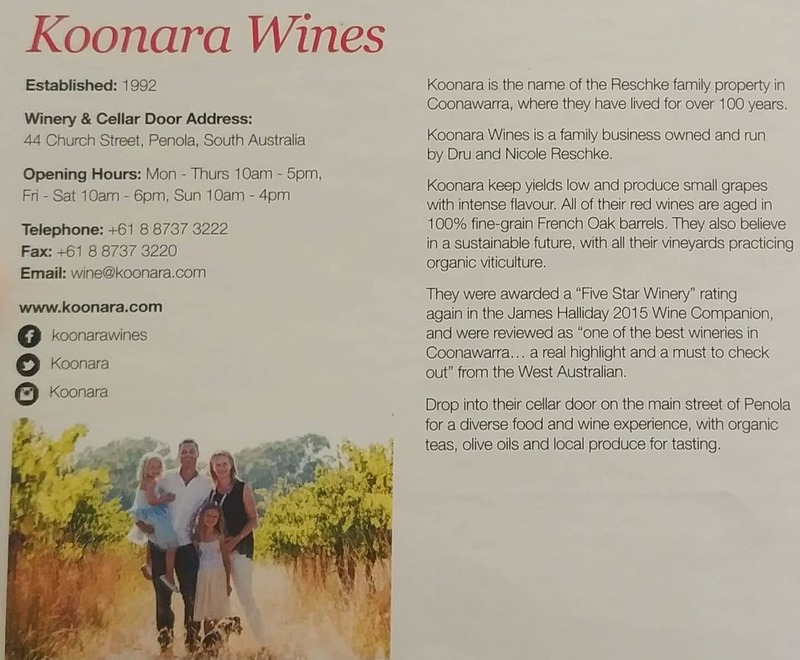 With a team of experienced winemakers, the Koonara Wines team started creating a range of unique wines for the public. They always give importance to quality; hence, they produce fewer cases and allow it to mature properly to develop an authentic flavour. At Koonara Wines, you will find acres of lush vineyards; featuring mainly Cabernet Sauvignon and Shiraz varieties. Check out their special aged wine editions; including Cabernet Sauvignon and spicy Shiraz. Their wines not only taste good, but also boast a consistent aged flavour.